Liverpool defender Trent Alexander-Arnold enjoyed a moment of sheer class to settle a dispute with Manchester United’s Jesse Lingard in England training. The pair can be seen in the video below, posted to the official England Instagram page, debating a close call in what must have been a training match or drill of some kind. They seemingly agree to settle this dispute if they can nail a long-distance crossbar challenge, which Alexander-Arnold does perfectly on the first attempt. 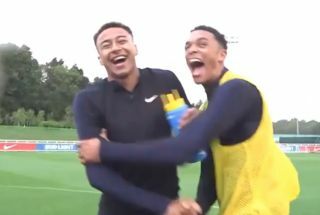 The Reds youngster and Lingard then laugh together, showing they get on alright really! It seems after the success of reaching the World Cup semi-finals in the summer, the mood remains strong in the England camp.